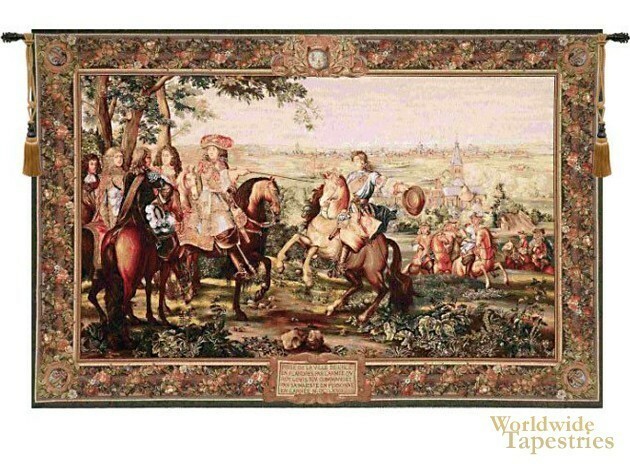 Known as “L’Histoire du Roi”, the series chronicling the life of Louis XIV (1638-1715) spanned 14 different tapestries. This is one of the 14 scenes. It shows the king surveying Lille, which his troops have captured from the Spanish in 1667. It marked a turning point in the king’s strategy, as he sought to invade Spanish Netherlands and expand his control over Europe. It used up his country’s funds and France’s influence on the continent decreased rather than increased as the Dutch and English seized on France’s misfortunes. The King is shown facing us on the left. He is surrounded by his chief military engineer, Vauban, and his military commander, Tureene. Finely detailed, this is a superb piece of both history and art. This tapestry is lined and has a tunnel for ease of hanging. Note: tapestry rod and tassels, where pictured, are not included in the price. Dimensions: W 86" x H 58"